Isn't Ina Garten fabulous? Doesn't everything she makes turn out wonderful? Isn't she just too cute? You don't have to answer those questions. Those are what you'd call rhetorical. But just in case you were wondering, I really do think Ina's pretty great. And her food. Oh my! Her food! I've featured a few other Ina recipes here before--if you haven't tried one, you should because they are delicious. Today, however, I think I've reached Ina Garten heaven. THIS has got to be one of my favorite Ina recipes EVER. I made these the first time a few weeks ago, and I loved them so much that I made them again . . . the same week! 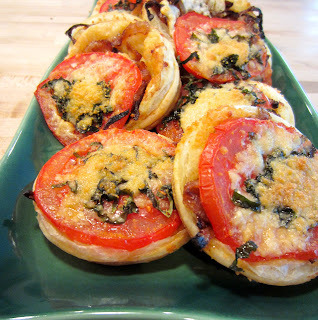 Tomato and Goat Cheese Tarts are going to be a go-to recipe for me this summer, I can tell you that already. My family will be sick of them by the end of June, I'm sure (but that's O.K. because I'm getting out of here at the end of June). So, with that overblown intro, let's get cooking. First, you need to caramelize your onion. (I would show you how to do that, but I forgot to take pictures.) Caramelizing onions takes a while if you want to get it right. And you do. Want to get it right. Basically, put some olive oil in a saute pan over medium to low heat and add the onions and garlic. Saute the onions for 15-20 minutes, until they are nicely brown (but not burned!) and delicious. Add a splash of wine, the thyme leaves, and a sprinkling of salt and pepper, and cook for a few more minutes. While the onions are cooking, prepare your puff pastry (make sure you thaw it first). 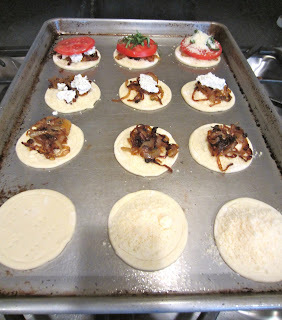 Now, Ina says to make larger circles than this, but I decided to use a biscuit cutter to make individual little tarts. They're cute, no? 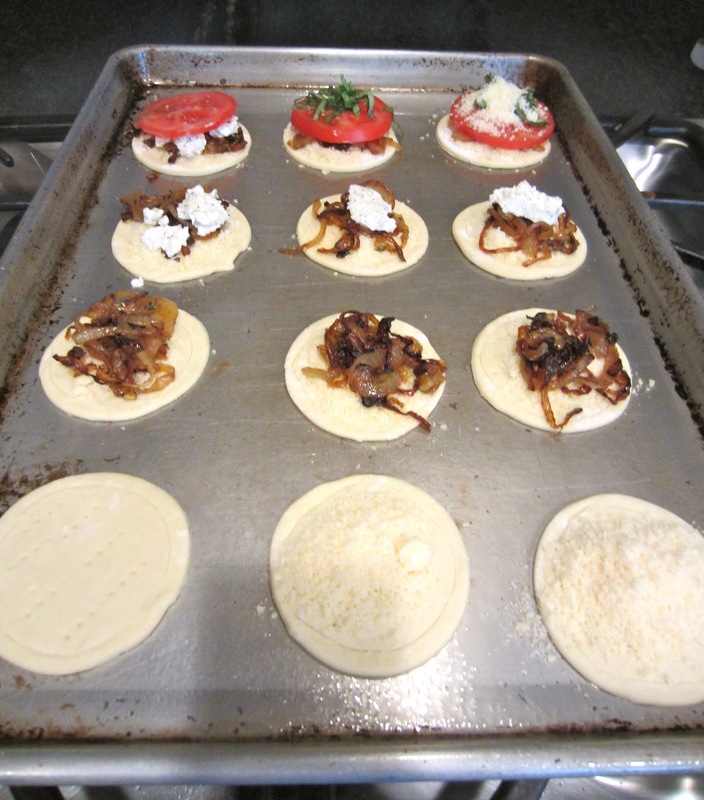 Once your puff pastry is ready, place the circles on a parchment-lined baking sheet (do as I SAY, not as I DO--don't you know that yet?--see below). Here you can kind of see the progression of things from the front row to the back. 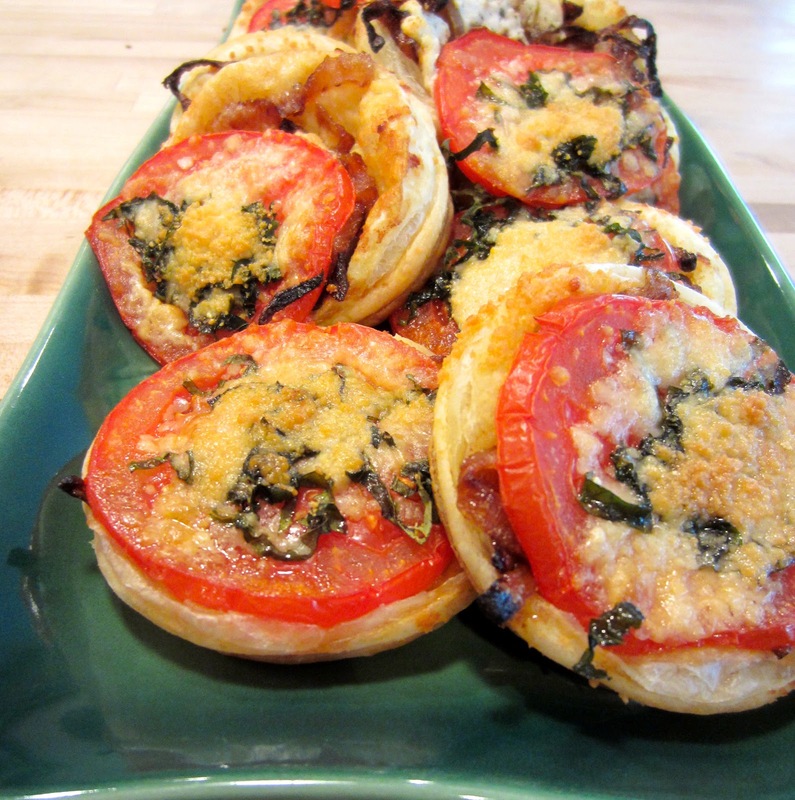 Now put the tarts in the oven and bake for 20-25 minutes until the pastry looks golden brown. Place on what? A pretty plate, and serve warm. Now you're in Ina Garten heaven. Enjoy! Oh my goodness those look fabulous! Yummm. These look wonderful. I do love goat cheese! And I'm crazy for tomatoes. Onions? Not so much, but I like them caramelized. Tell me, what would these be like without the onions? Or does that just sound ridiculous? I need your opinion, Oh Wise One! I share your love for Ina. And those look delicious! Wow. If I could get my kids to eat the onions, I'd make them. My house this weekend? Slow Cooker Coconut Chicken Curry. Chicken Parmesan. Meatloaf. Roasted Cauliflower. Pioneer Woman's 'Drip Beef'. Plus 2 bite cupcakes (carrot, chocolate, vanilla), and pie. Apple, Banana Cream. The end. I'm tired already. ;) Some of this is for the freezer for when I hit the wall. Coming soon, no doubt! Ah, Ina. 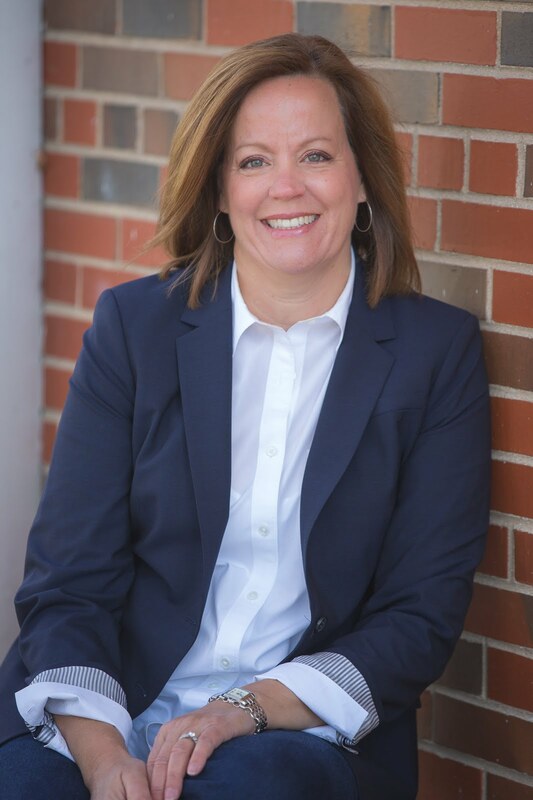 Love her, too.